A recent contributor to our web site, Mr John Wernham, has supplied us with some information regarding a gentleman who lived in Benfleet High Road, who gave him piano lessons in the 1950s. John has been able to supply us with one or two of his memories of this gentleman, but is keen to find out if anyone else remembers this man or perhaps has a photo of him. “I used to have piano lessons with a Mr Mannall, whose son Alan, was a teacher at St Margaret’s C of E School in Bowers Gifford. He lived in a very large house named “River View” halfway down the High Road in South Benfleet. I stayed there with him many times at weekends, when my mother was ill and sadly could not look after me. I can never remember seeing the river, so where the name “River View” came from I do not know, as my bedroom was upstairs. What I do know is that Mr Mannall was a school governor of St Margaret’s School in Bowers Gifford, where his son Alan was a teacher. At school I had to address him as “Mr Mannall” but at many of my weekend stays at his father’s home, I just called him Alan. Very confusing for an eight year old boy! I, like many others back then, were told to respect our elders and address them as Mr, Mrs or Miss. Mr Mannall was a very clever, eccentric man, who always rode around South Benfleet on his very old bicycle, dressed in top hat and tails. His home was full of antiques, as well as two Steinway concert grand pianos and one Beckstein upright piano. These pianos are the very best in the world and cost thousands of pounds. Sadly, his house is no longer there, it has been pulled down and new houses built on the land. 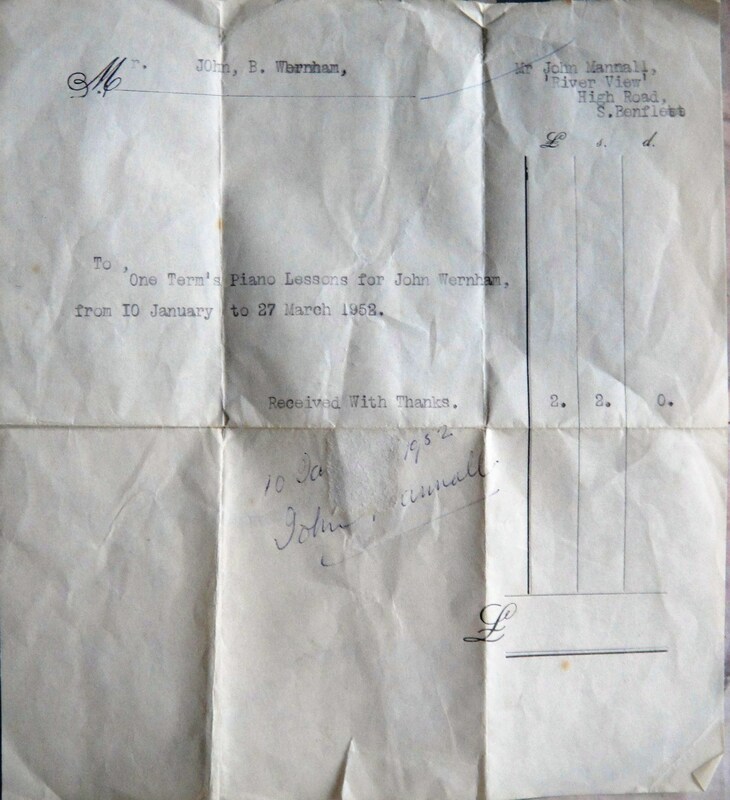 Armed with this information, together with a copy of a receipt for piano lessons, we were able to find out a little more about this gentleman, whose full name according to the receipt was John Mannall. The house “River View”, was given the number 463 in the 1950s, which enabled us to pin-point exactly where the property was. This was backed up by some research showing that Mr Mannall appeared in the local telephone directory dated 1959, showing his address as 463 High Road (albeit his surname was incorrectly spelt as Manual). This means the house was between Cemetery Corner and Tarpots, just past Benfleet Horticultural Society premises on the west side of the High Road. Did you have piano lessons with this gentleman or do you remember him riding his bicycle around South Benfleet? If you do we would be very pleased to hear from you. Are you the same Bill Smith that was the Wheel Builder for Bert Geeves`s Motor Cycles in Benfleet ? And if you were, did you belong to the Triumph Motor Cycle Club in Wickford back in 1964 ? Would love to hear from you again, and to talk about old times. I had piano lessons with John Mannall in the 1950’s. His house was on the left of the High Road heading towards Tarpots Corner and was about 150 yds from the horticultural society premises. He was a friend of my father and yes I remember him riding around on his old bicycle in his quaint attire. His son Alan went to Fryerns Grammar Technical School in Basildon and used the surname – Mannall-Fretwell ! Another gentleman rode around Benfleet on a bicycle dressed in Army uniform complete with gas-mask and highly polished boots. I don’t know who he was or if he was retired (I presume he was, he looked to my child’s eyes to be “ancient”) or if he had ever been in the army. Where are characters like these today?